Al-Jahalin Bedouin camp in the Israeli-occupied West Bank. © OCHA/European Union, 2011.
in September 2010. © OCHA/Truls Brekke/FAO. 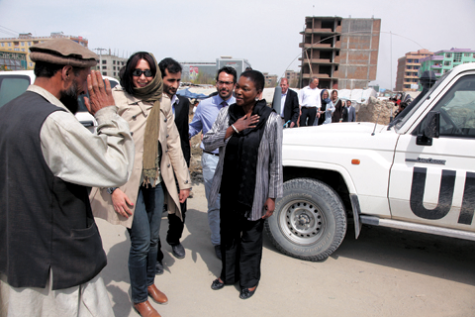 Valerie Amos visits Za’atri camp. 27 November 2012.
visit to Afghanistan. © OCHA/UNAMA. 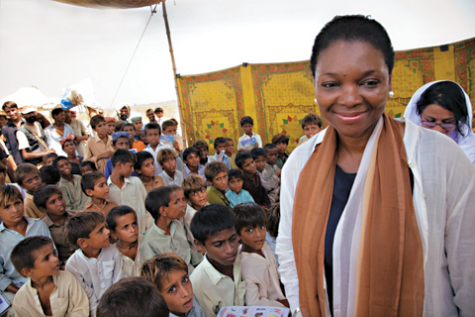 As the United Nations Under Secretary-General for Humanitarian Affairs and Emergency Relief Coordinator, Baroness Valerie Amos leads the coordination of all emergency relief operations requiring United Nations (UN) humanitarian assistance. On 7 November 2012, Baroness Amos addressed the UN Global Compact Network Australia about the increasingly important role that business partnerships are playing in the UN’s efforts to address global challenges. Here’s what she had to say. The private sector is a natural partner for the UN – a global organisation with the interests of people at its heart. But it has taken time for us to see all the possible partnership opportunities. The UN Secretary-General, Ban Ki-moon, has stressed the importance of engaging the private sector and civil society with the organisation, and made the creation of multi-stakeholder initiatives and strategic partnerships one of his top priorities. Companies are increasingly focused on finding the best ways to demonstrate their strong commitment to using their experience, expertise and skill base to add value to the communities in which they work, not only at the local and national level but also at the global level. The size, scale, and depth of the UN’s partnerships, not only with the private sector but with member states, regional organisations, academic institutions and civil society, has grown significantly in the last 20 years. And that is for a range of reasons. It is partly because the UN has never been under as much pressure to deliver on so many fronts as it is today. But it is also because we know that the UN cannot solve the world’s problems on its own. When we look at the challenges facing our world – conflict, financial crisis, environmental degradation, climate change, poverty, inequality, injustice – it is clear that no one organisation, despite the multiplicity of its mandates, can deliver the change. Expectations are high that diplomacy and negotiation will prevent or halt war; that the UN will keep the peace in some of the most volatile areas of the world; that we will look after refugees, feed the poor, rescue the vulnerable and speak up on behalf of the voiceless; regulate when regulation is needed; that we will support governments and develop their societies; and that we will work together to promote harmony, justice and equality. In my area of work we had a particularly challenging year in 2012. It has been dominated by the conflict in Syria, divisions in the international community and stalemate on the Security Council, the daily slaughter of ordinary women, men and children, and the displacement of over 1.5 million people in the country. Women and children are particularly affected, as in many other crises in the world. There has been a breakdown of the health system, the targeting of infrastructure and the specific targeting of ordinary people. Some 400,000 people have fled to neighbouring countries – Turkey, Jordan, Lebanon and Iraq – where they are registered as refugees. The situation is creating insecurity throughout the region. Elsewhere, our top priority has been the Sahel region of West Africa, a region many people have never heard of that includes Chad, Niger, Mali and Burkina Faso. A major food crisis there is affecting some 18 million people as a result of drought, now compounded by flooding in many countries. The crisis has had a particular impact in Mali, where two-thirds of the geographic area of the country is no longer under the control of the government following a coup. There are now Jihadist and Islamist elements in the north of the country, and they are exporting violence and insecurity to other countries in the region, particularly Niger and Burkina Faso. Other priorities include Sudan, where the humanitarian crisis continues in Darfur, and in the southern states of Blue Nile and South Kordofan. There are tensions between Sudan and its neighbour, the world’s newest country, South Sudan, which has seen ethnic violence, the arrival of refugees from Sudan and terrible poverty. We are also dealing with ongoing crises in Yemen, the Democratic Republic of the Congo, Myanmar, Afghanistan, Haiti… the list goes on. In 2011, we coordinated humanitarian relief for 56 million people in 33 countries. But overall needs were even greater than that. Disasters and emergencies affected 245 million people and caused record-breaking economic losses of US$366 billion. The number of refugees and displaced people at the end of 2011 was 42.5 million, including more than 4 million who were forced from their homes in the course of that year alone. My organisation is the UN Office for the Coordination of Humanitarian Affairs (OCHA) – the part of the UN that is responsible for bringing together humanitarian actors to ensure a coherent response to emergencies, whether they are caused by conflict or natural disasters. It’s our job to coordinate the international response, in partnership with governments, national and international organisations, no matter where they happen. It’s our job to make sure we know what the needs are – who is available to respond and to help raise the money to make that response as effective and efficient as possible. We are responsible for coordinating the work of all the UN humanitarian agencies – for example, UNICEF, the World Food Programme and UNHCR, the UN refugee agency – as well as major international humanitarian NGOs, such as Oxfam, CARE or World Vision. 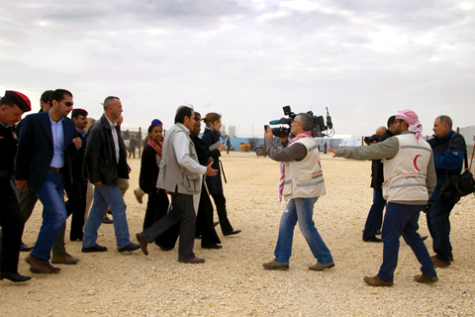 We also work with the Red Cross and the Red Crescent movements. OCHA manages resources and makes them more effective by channelling them to priority programmes, and we have an important role to play in giving the people affected a voice, and helping them to get heard. We also have a long-term presence in countries that are suffering from protracted emergencies, including Yemen, South Sudan, Afghanistan and the Democratic Republic of the Congo, where nearly two and a half million people have been forced to leave their homes because of violence. Our work in the Asia Pacific region – the most disaster-prone in the world – focuses largely on disaster response. Twenty-seven countries in the region suffered natural disasters in 2011, affecting more than 176 million people. We responded to 10 of these crises, including the world’s deadliest disaster in 2011: the Japanese earthquake and tsunami, which killed almost 20,000 people and caused an estimated US$210 billion of damage. We were on the ground, providing an overview of the crisis and coordinating urban search and rescue. Given the scale, size and severity of natural disasters, we know that we have to work to build a more diverse and inclusive humanitarian system, capable of responding to the myriad demands which are now being made of us. People’s expectations – rightly – are higher. And technological developments and innovative ways of working are showing us how we can work with organisations in the private sector to do things differently. Until now, we have not engaged with private-sector stakeholders in a systematic way. We’re aiming to change that. We have watched many companies forging strong relationships with other UN agencies and International NGOs. For example, the World Food Programme (WFP) is working with the management consultancy firm the Boston Consulting Group, and the agricultural giant Cargill. The international NGO World Vision has partnerships with Microsoft, Goldman Sachs and UPS. The WFP has initiated a five-year public-private partnership called Laser Beam, aimed at eradicating child malnutrition, which is being piloted in Indonesia and Bangladesh. Many of our sister agencies deliver aid, so their work on the ground in emergencies is more high-profile and visible to private sector partnerships than the work of OCHA, which is primarily a coordinating body. But we do have some important strategic partnerships. Western Union is one of our long-standing partners. We have been working together since 2008 for the benefit of the Central Emergency Response Fund. With 445,000 locations in 200 countries and territories, Western Union is naturally concerned when crises impact the communities it serves. Donating to our emergency fund is a way of helping to meet some of their business needs. We have also built important partnerships with IT and telecommunications companies that give us vital help in emergency situations, and are critical to the coordination of information. For example, Ericsson has a long-standing partnership with humanitarian organisations, bringing communications and related services and expertise to support relief operations. In Haiti after the earthquake, an Ericsson team set up a mobile network that provided an average of 5,000 free calls per day to humanitarian workers for six months. Ericsson also has a volunteer programme, which gives its employees the opportunity to make a difference in society. Our partnership with DHL-Deutsche Post is also important to us. DHL runs three programmes called GoGreen, GoHelp and GoTeach, which are aimed at improving employee motivation, increasing brand awareness and recognition and strengthening competitiveness. Working with OCHA, more than 400 DHL staff have been trained and are ready to be deployed within 72 hours of a disaster, to manage airport warehouses, sort donations and repackage donated items. Since 2005, DHL Disaster Response Teams have been deployed to some 20 disasters, including Cyclone Nargis in Myanmar and the devastating floods that hit Pakistan in 2010. DHL say these areas of joint action are a ‘win-win’. The company believes that its commitment to social responsibility makes it easier to attract and retain high-calibre staff, who are more likely to show greater dedication and commitment to their work. Our creative partnerships focused on outreach and awareness raising are also based on enhancing employee engagement and increasing our global reach and influence. The most striking example of this was our campaign for World Humanitarian Day in August 2012. It’s a day focused on remembering the sacrifices humanitarian workers make around the world. With the help of the Australia-based advertising company Droga-5, the global superstar Beyoncé, her management company, Parkwood Entertainment, and other global players including Ridley Scott and Associates and Sony Music; OCHA launched a video of the song ‘I Was Here’, filmed in the UN General Assembly Hall, that reached a staggering one billion people on social media. The video is still playing on MTV and other networks all over the world, and has been viewed more than 12 million times on YouTube. We’re planning to build on this campaign, and developing other ideas with our partners including a project that we hope will have an impact on our fundraising with the global public. We’re also working with representatives from Warner Music on an online platform called Shift the Beat, which mixes music and technology to raise awareness about humanitarian issues and tap into the social media networks of entertainment stars. These partnerships bring awareness of what we do to huge new audiences. But we don’t want to stop here. If we are really going to do things differently, we have to work harder to help countries and communities prepare better for disaster and put systems in place to minimise their effects. For example, helping to forecast volcanic eruptions at Mount Merapi in Indonesia, and teaching Japanese schoolchildren how to respond in emergencies. Risk reduction is a very effective use of resources; it’s estimated that every dollar spent in this area saves eight dollars down the line. But investment in preparedness – especially in high-risk countries – is still completely inadequate. For every US$100 spent on humanitarian aid, only 75 cents is spent on preparing for and preventing disasters. The rest is all spent on responding to crises after they have happened. The World Economic Forum already runs a Risk Response Network, which provides private and public sector leaders with an independent platform to map global risks. We are working with the Forum in this area. We are also collaborating with Maplecroft, the global risk and strategic consulting firm, to develop its annual Global Focus Model: an analysis of hazards, vulnerabilities and capacities which forms the basis of our prioritisation of countries that need to improve their level of preparedness. Corporate disaster planning generally focuses on the internal processes of business continuity, which is of great interest to us, both internally – as we all saw again during Hurricane Sandy – and as we work to support others. We believe there are also other areas where our interests coincide very closely with private sector organisations, including risk mitigation and building resilience, and we are particularly keen to find partners who can support us in monitoring the results of our work, increasing transparency and accountability. OCHA has just set up a dedicated office in Geneva to work on a private sector strategy, to review and map our partnership portfolio, including assessing our existing partnerships. The private sector is playing an increasingly important role in supporting the UN’s work across the board, from helping to deliver life-saving drugs to the development of sustainable energy sources. Formerly the United Kingdom’s High Commissioner to Australia. Former Leader of the House of Lords and Secretary of State for International Development (UK). Former Chair of the Royal African Society and a Fullbright Commissioner. Her work in campaigning for human rights, social justice and equality.